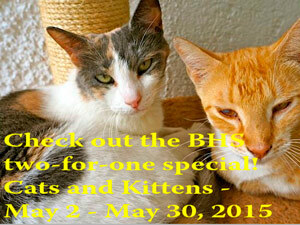 From now until May 30th, all cats and kittens are two-for-one. Tuesday, May 12 – Quiz Night at the Green Parrot, Nassau side. Come test your trivia knowledge and support the animals. Teams of 2 – 6 players. Registration fee is $10/player. Registration begins at 7 p.m.; questions start at 7:30. 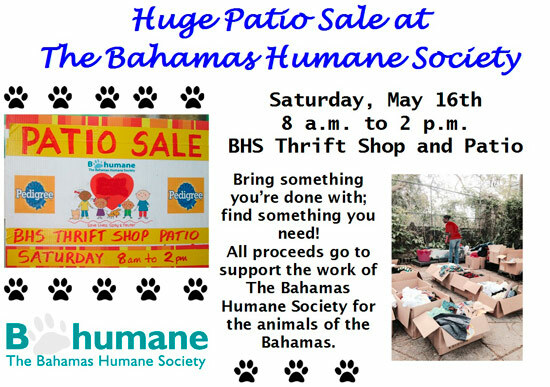 Huge Patio Sale at the BHS Thrift Shop – Saturday, May 16th – 8 a.m. to 2 p.m. Clothing, housewares, books, and more All sales support the BHS. Volunteers are still needed for the day If you’re able to help out for an hour or two or more, please let Linda Aranha know. For those of you that saved the date of June 13th, please note that the event has been rescheduled to June 20th. Join us to celebrate the Summer Solstice. Details to follow. BHS Summer Camp registration has begun and slots are going quickly. Prevention is less costly than cure. The BHS is celebrating its 90th year this year! It costs approximately $2,900/day to run the BHS Shelter! Are you a member? If not, why not? Join us today. Membership is our bread and butter (and kibble, too! ).